For a good chunk of last season, some may have been under the impression that Ryan Callahan was going to be a third-line forward who would chip in with a goal every now and again. They'd have a right to think that way, considering the New York Rangers' fourth-round draft choice in 2004 had only 8 goals in 52 games. The Rochester, N.Y., native struggled so much to regain his scoring touch after a knee injury that he was ultimately sent to the team's American Hockey League affiliate in Hartford. The move paid off. Callahan returned late in the season and helped the Rangers secure the fifth seed in the Eastern Conference. He would tally 2 goals and 2 assists in 10 postseason contests, giving him some momentum and something positive to think about heading into training camp. "When I came back, I wasn't putting points up and I didn't have the jump that I usually do," Callahan told NHL.com. "I wasn't playing the same game, for whatever reason. I think the staff here made a good choice and they sent me down to Hartford. I spent three weeks there and felt I got my game back and I got my scoring touch back. The coaching staff down there helped me out a lot and gave me a lot of minutes. When I came back up for the playoff push, I felt I was back to myself and creating things. It just carried over into this year." It sure has. Callahan, who just turned 24 last Saturday, extended his points streak to six games in Sunday night's 2-1 loss to the Ottawa Senators at Madison Square Garden. Twenty-four hours earlier, he scored twice -- his 18th and 19th goals of the season -- in a 5-3 win against the Buffalo Sabres. Truth be told, it was probably only a matter of time before Callahan started to really contribute offensively. 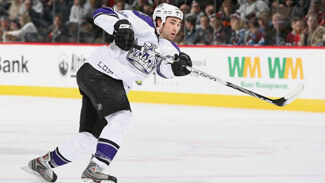 As a junior, Callahan scored 130 goals, including 52 in 2005-06. In his only full season at the AHL level, he had 35 goals in 60 games for Hartford. "It's nice," Callahan told NHL.com. "I struggled a bit last year with an injury, but this year I thought I've been playing pretty well. Just being able to put the puck in the net, that's a big thing for me. What comes along with that is confidence. This season I came in wanting to contribute offensively. I'm pretty happy with the way things have been going." He should be, considering he's become one of New York's more consistent players. A tenacious forechecker who is fearless in front of the net, Callahan has helped keep the Rangers in the postseason race following a midseason tailspin that cost Tom Renney his job. Callahan, though, has thrived under new coach John Tortorella. "I think it suits my game personally pretty well," Callahan said. "I'm a straight-ahead guy and I like to get in on the forecheck and pressure the 'D' into mistakes. That's what this system's all about. "I think we're just feeling more comfortable, period," Callahan said. "The last couple of games we've been going hard. We're starting to really get the system under Torts. I think that shows and it gives us confidence knowing that the system works." When asked if he's beginning to feel like he can score every time he touches the puck, Callahan chuckled. In recent weeks, though, he's consistently found ways to bring the Garden faithful out of its seats. "I just try to get the puck on net," Callahan said. "A lot of goals in the League these days are scored right in front of the goalie, and I think that's what I try to do. I like to go to the net hard and bang in those rebounds. They're going in right now." That's music to Tortorella's ears. While he hasn't been behind the Blueshirts' bench for very long -- Tortorella was hired on Feb. 23 -- he has been awfully pleased with the right wing. "When I came back, I wasn't putting points up and I didn't have the jump that I usually do. I wasn't playing the same game, for whatever reason. I think the staff here made a good choice and they sent me down to Hartford." "He's just a baby, he's just a kid," Tortorella said. "I give a lot of credit to (Jim Schoenfeld), as far as what he did with him, (Brandon) Dubinsky, (Daniel) Girardi ... players like that down in the minors, to give them the foundation. He's a guy that I can use in all aspects of the game -- times of the game, situational plays. He's a guy that I can use all over the place. He's a guy that you can move all over the place, which is so important." Considering he's still only 24, one has to wonder just how much Callahan will bring to the table four or five years from now. Clearly, though, he's making a name for himself at the sport's highest level. "I'd like to think I'm trying to," Callahan said. "I don't know ... there are so many good guys in this League, I don't really think about it too much. I just try to go out there every night and do my job and let the chips fall where they may."